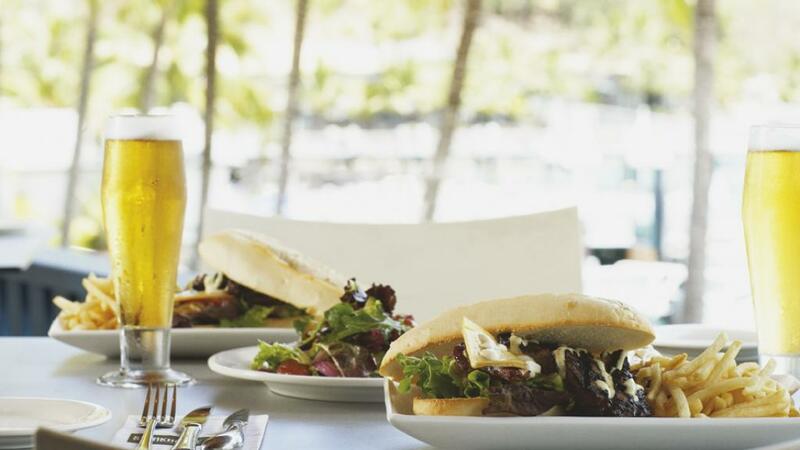 Hamilton Island is a food lover's paradise. With over 10 restaurants and takeaway outlets to choose from, there is always something new and exciting to tempt your tastebuds! Enjoy a huge range of cosmopolitan cuisine including a variety of international styles and the freshest seafood. This intimate guests-only restaurant offers modern Australian cuisine made from organic local produce served al fresco by the poolside or in the elegant beachfront dining room. Enjoy South East Asian cuisine at its best. This family friendly restaurant is set overlooking Catseye Beach and the stunning Whitsunday Islands plus is within an easy walking distance of most of the accommodation on Hamilton Island. Set amongst tropical landscaped gardens and overlooking the Reef View pool, The Pool Terrace Restaurant offers a fantastic buffet breakfast as well as a delicious lunchtime snack menu. Cruise into the night in traditional style aboard the Hamilton Star, a stylish Hollywood-style 107-foot motor cruiser crafted from Huon pine. After canapes and drinks are served on the deck, the Hamilton Star moors at a secluded location and a four-course a la carte meal is served. On the return cruise to Hamilton Island, cocktails and star-gazing complete a perfect evening at sea. Wood-fired gourmet pizzas are the order of the day at the laid-back Manta Ray Cafe, overlooking the marina's bobbing masts. Local seafood, meaty mains and Italian pasta dishes are also a hit on the menu, and drinks are served in the convivial bar. 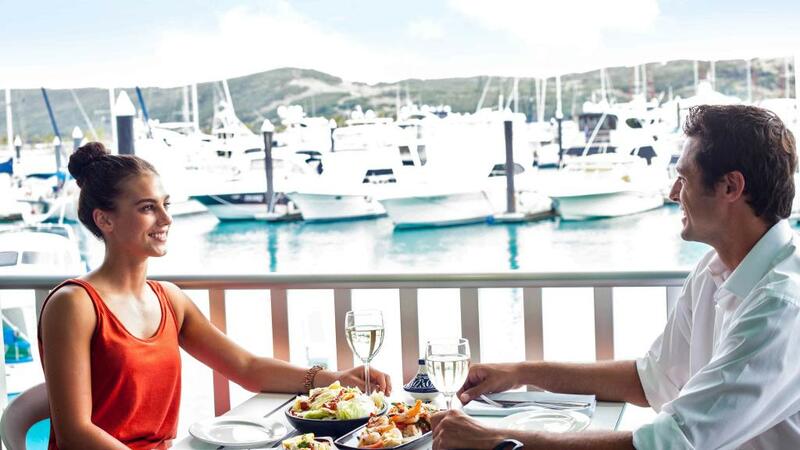 Where better to sample the famous seafood of the Whitsundays than overlooking the marina on the deck at Mariners, located in the heart of Hamilton Island's Marina Village. Carnivores go for juicy chicken breast or rib fillet, but lovers of seafood can't go past Mariners' generous seafood platters, crispy salt and pepper calamari, chilli prawns and pan-seared fish fillets. With a daily-changing menu highlighting fresh seafood prepared with Italian flair, Romano's is the venue for celebratory holiday dining by the marina. Romano's professional staff are welcoming and attentive, and atmospheric candlelight sets the scene for romance at tables overlooking the Marina. Perched atop neighbouring Dent Island, the restaurant and bar at the Hamilton Island Golf Club take in mouth-watering views of Passage Peak and the Whitsundays. Long lunches featuring premium seasonal fare are a speciality at the Clubhouse restaurant, along with day-long snacks and morning and afternoon tea. Located in the heart of Catseye Beach, Sails offers family friendly dining with bistro meals by the poolside and live jazz or rock into the night. A breakfast favourite. Laid back and casual, and right at the heart of the Marina Village. Grab a gourmet panini, wrap, fresh juice or great coffee. With so many casual takeaway outlets on the island there’s no need to sit down at a restaurant every night. Sample everything from traditional baked goods, fish and chips to gourmet deli. Then unwind with a sundowner at the Marina Tavern, Verandah Bar or the new One Tree Hill café and bar. Breakfast with the koalas. Start the day by hugging a koala and enjoying a hearty barbecue breakfast at the Koala Gallery. Every child's favourite breakfast venue, Wild Life Hamilton Island is watched over by sleepy koalas munching on gum leaves, and the buffet breakfast includes grilled eggs and omelette's. Inspired by the rich colours of the Coral Sea, marine life and the soaring silhouette of full sails, the iconic Hamilton Island Yacht Club will be a destination for those who appreciate international boating excellence. The new home of fine dining on Hamilton Island, Bommie is the signature restaurant Bommie at the sparkling Hamilton Island Yacht Club. Make a booking to dine inside the city-slick restaurant, with its elegant dark wood and white linen. Or share a drink and snacks outside on the deck, where marvellous views take in the marina and Whitsundays. Inside and out, Bommie's decor reflects the yacht club's stylish nautical design. Bommie Restaurant features modern Australian cuisine and is open from 6 pm Tuesday - Saturday and welcomes guests 12 years and older. Families and couples alike will enjoy having their tastebuds tantalized with regional cuisines from Mexico. Found by the marina, it is the perfect location to relax with a margarita as you watch the sunset. Sit back with a sunset cocktail by the marina or order drinks from the swim-up bar, then settle in for an evening of dancing, live music and good company in Hamilton Island's stylish bars and nightclubs. Bars located on Hamilton Island include Marina Tavern, Bohemeas Nightclub, Verandah Bar, Sunset Cocktails, Bougainvillea Bar, Island Bar, Reef Lounge and Bommie Deck. Spa Wumurdaylin meaning dragonfly, is set amongst the beautiful Whitsundays and offers total relaxation. On your holiday to Hamilton Island utterly unwind and treat yourself to a soothing massage, rejuvenating body treatment or revitalising body wrap at the Islands Spa and fall right into holiday mode. Treatments include; body cocoon wraps, exfoliations, facials enhancements, alternative therapies, massage and body treatments. Open daily from 9am-7pm.